Bryce Canyon National Park is very photogenic know matter what season you visit. But many people think the scenery is most stunning in winter. The folks at BudgetTravel.com agree. They are featuring the park as one of 25 "dazzling snow scenes." A prominent link on the website home page leads to a sideshow with images from the 25 scenes, which come from around the world. Besides Bryce Canyon, the scenes include "The Wave" on the Utah/Arizona border and the Grand Tetons in western Wyoming. This link should take you to the article. However, it seems like their server is getting more traffic than it can handle and the page hasn't been coming up lately. I did see it, and it is impressive, but lately it comes up with a server error. So, the photos shown here are mine. 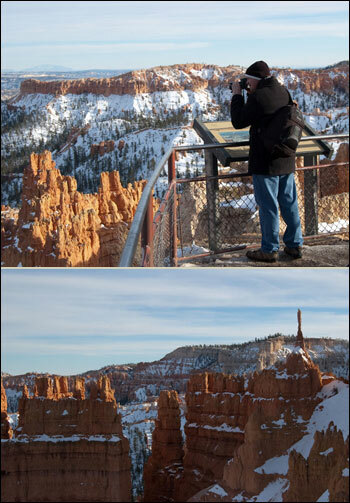 I visited Bryce last week specifically to get winter photos. That was an easy and enjoyable assignment. I hiked along the rim and also hiked a couple trails down into the canyon and came back with a bunch of great photos. There was about a foot of snow on the ground. Trails were snowpacked with icy spots. Park people had sprinkled sand on the ice and so traction was not a problem. I was surprised by the number of people in the park. There were people on all of the trails and at all of the viewpoints. Bryce in winter is catching on.